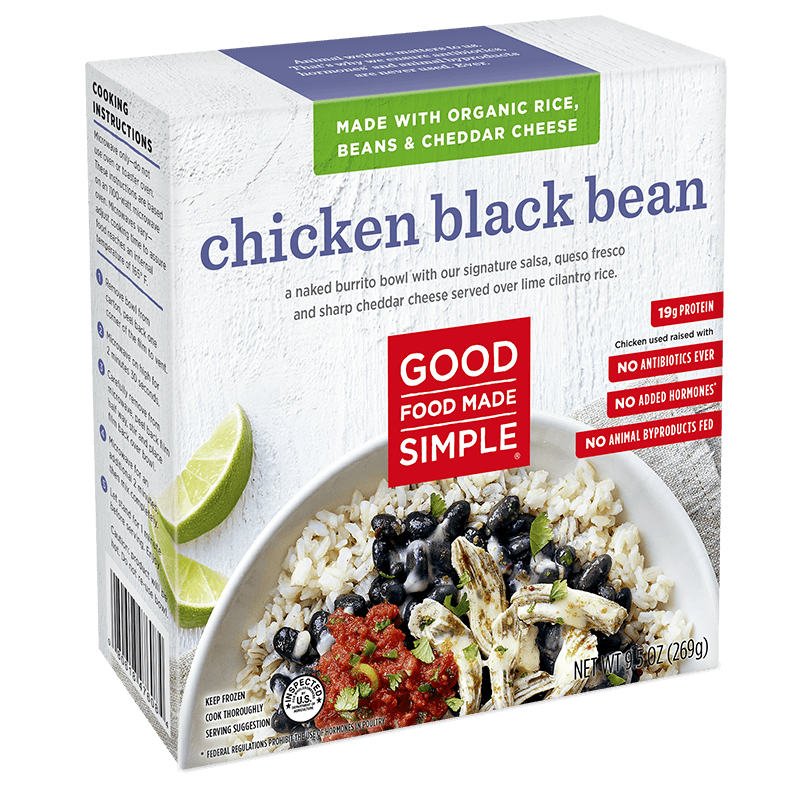 For times when you want to go tortilla-less, dig into this bowlful of traditional Southwestern flavors including tender chicken, organic black beans, our signature organic salsa, queso fresco & sharp cheddar cheese served over lime cilantro rice. Whew, that was a bowl full. RICE (COOKED RICE [WATER, ORGANIC WHITE BASMATI RICE], ORGANIC CILANTRO, ORGANIC CANOLA OIL, LIME JUICE [WATER, LIME JUICE CONCENTRATE AND LIME OIL], SEA SALT), BEANS (ORGANIC BLACK BEANS [ORGANIC BLACK BEANS, WATER, SEA SALT, KOMBU SEAWEED], GUAJILLO PEPPER PUREE [WATER, GUAJILLO PEPPER, CITRIC ACID], ORGANIC ONION, ORGANIC CELERY, WATER, ORGANIC CHICKEN BASE [ORGANIC CHICKEN MEAT AND JUICES, SALT, ORGANIC CANE SUGAR, ORGANIC MALTODEXTRIN, NATURAL FLAVOR, ORGANIC DRIED ONION, ORGANIC POTATO STARCH, ORGANIC DRIED GARLIC, ORGANIC TURMERIC, ORGANIC SPICE EXTRACTIVES], CORN STARCH, ORGANIC CANOLA OIL, ORGANIC GARLIC, ORGANIC CILANTRO, CHIPOTLE ADOBO PUREE [WATER, ONION, DRIED CHIPOTLE PEPPER, TOMATO PASTE, CANOLA OIL, SUGAR, VINEGAR, SALT, GARLIC PUREE, NATURAL SMOKE FLAVORING, SPICES], ORGANIC SPICES), TOMATO SAUCE (ORGANIC TOMATOES [ORGANIC TOMATOES, ORGANIC TOMATO PUREE, SEA SALT, NATURALLY DERIVED CITRIC ACID], WATER, ORGANIC ONION, ORGANIC GREEN BELL PEPPER, ORGANIC GREEN ONIONS, CORN STARCH, WHITE VINEGAR, SEA SALT, ORGANIC GARLIC, ORGANIC CILANTRO, LEMON JUICE CONCENTRATE, CHIPOTLE ADOBO PUREE [WATER, ONION, DRIED CHIPOTLE PEPPER, TOMATO PASTE, CANOLA OIL, SUGAR, VINEGAR, SALT, GARLIC PUREE, NATURAL SMOKE FLAVORING, SPICES], ORGANIC SPICES, ORGANIC CAYENNE PEPPER), COOKED SEASONED CHICKEN (CHICKEN BREAST MEAT WITH RIB MEAT, WATER, LESS THAN 2% POTATO STARCH, SALT, NATURAL FLAVORS, SPICE, LIME OIL), ORGANIC WHITE CHEDDAR CHEESE (CULTURED PASTEURIZED ORGANIC MILK, SALT, ENZYMES), FRESH CRUMBLING CHEESE (CULTURED MILK, SALT, ENZYMES, CULTURES).